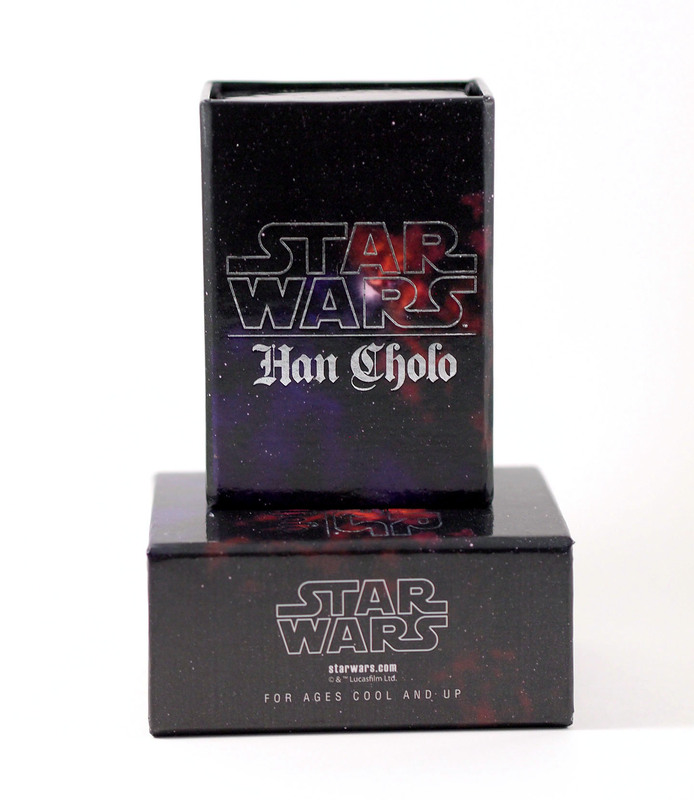 Han Cholo Review and Giveaway! Today we have something exciting in store. 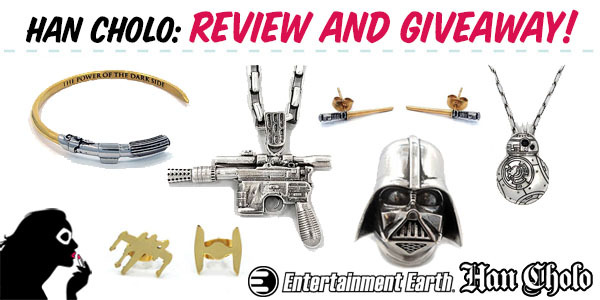 We’ve teamed up with Entertainment Earth to review and give away some amazing jewelry pieces from Han Cholo! Along with the Force Awakens items we rounded up in the last post, the pieces featured in today’s post will be sure to wow any Star Wars fan. Brandon Schoolhouse, the brains behind Han Cholo, has been creating jewelry since 2003. Starting out as a stylist and performer in the music industry, it was his unique jewelry pieces that really got him noticed. Specializing in “street wear” jewelry, his work has been worn by countless celebrities, and now that signature style is spreading to Star Wars. No stranger to licensed items, having created pieces for Tron, Voltron, and Battleship, this new collection is by far the most ambitious. From rings, to necklaces, to earrings, and even cuff bracelets, you’re sure to find a piece that speaks to you. 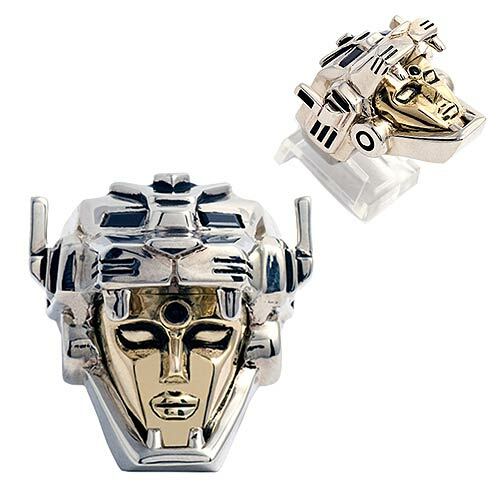 While Han Cholo typically focuses on their Precious Metal items, which are made from either sterling silver or gold, they also offer items from their Shadow Series which includes stainless steel pieces. This allows for a Star Wars fan to find something they’ll love no matter what the price point. Personally, we really fell for this Vader Saber Cuff. Given that Han Cholo is fairly new to creating Star Wars jewelry, we were thrilled when Entertainment Earth reached out to us to check some out in person. After some back and forth, we decided on this Darth Vader ring and the pendant featuring Han Solo’s Blaster. We received the pieces and immediately noticed how nice the packaging was. Both pieces were individually wrapped in these custom boxes and then contained in or displayed on a thick foam. Not only that, but the boxes definitely had some heft to them, which was further supported once we took them out of the boxes. 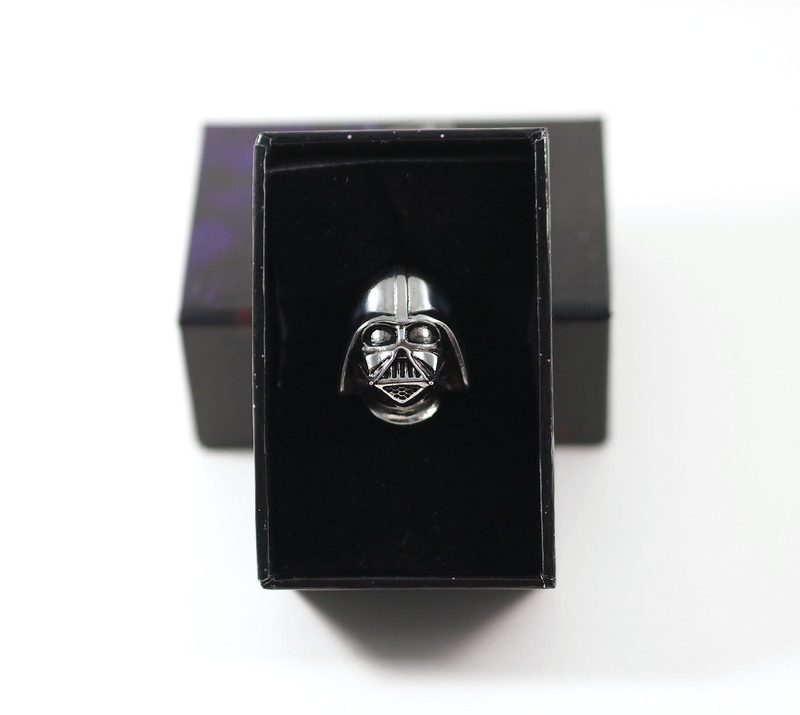 We took a look at the Darth Vader ring first. It was definitely very substantial, and isn’t something to wear if you want to keep your love of Star Wars secret. This ring is made from stainless steel, but if you’re interested in the more expensive version, it also comes in silver and gold. The ring also has has some antiquing which really brings out the details in Darth Vader’s face. Speaking of Vader’s face, we did notice that the respirator had some sharp edges, so definitely something to keep in mind when wearing it. The ring ranges from size 9 up to size 12, so unfortunately for us, it was a bit too big. Also, due to it’s size, the ring can end up looking a bit comical if you have smaller hands. However, for those of you with larger fingers, or have a significant other who is a fan of Star Wars, this would be a very unique gift. Next, we took a look at the Blaster pendant. Once again, this piece has a really nice weight to it, and featured antiquing that brought out the details in the blaster. This piece was stainless steel, like the ring, but Entertainment Earth also offers a version with a golden finish. The chain the pendant comes on is 30″ long which makes it very easy to slip over your head. The length of the chain may be long for some, but due to the size of the pendant, a lower length ends up looking better. Personally, we tend to opt for chains with smaller links and would most likely swap it out for a different one. After seeing these pieces in person and gauging the quality, we’d definitely recommend picking up a piece or two. 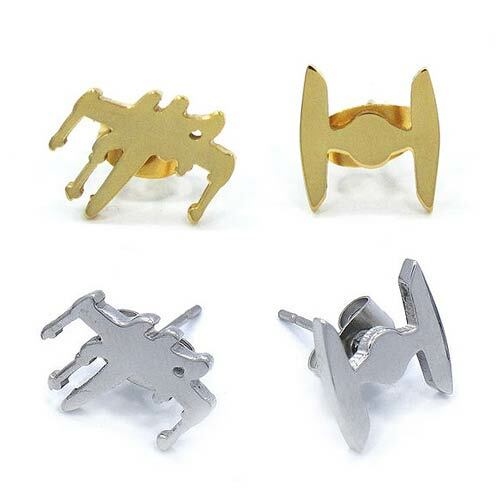 While we personally might stay away from the larger rings, these X-wing and Tie Fighter earrings, or this Obi-Wan lightsaber ring are both pieces we’d be interested in picking up. If you’re interested in seeing more, check out the other pieces that Entertainment Earth will be releasing here. Additionally, if you’re looking for something a bit more precious, you can find the full range of higher end jewelry pieces at Han Cholo. Now for the fun part, the giveaway! Two winners will be chosen at random to receive one of the two jewelry pieces we reviewed (the Vader ring and Blaster pendant). For extra chances to win, we’ve included several options that will give you multiple entries in the giveaway. We love hearing from you, so leave us a comment or answer our question for a better chance at winning one of these pieces! You can either enter by clicking on the link below, or by visiting our Facebook Page! 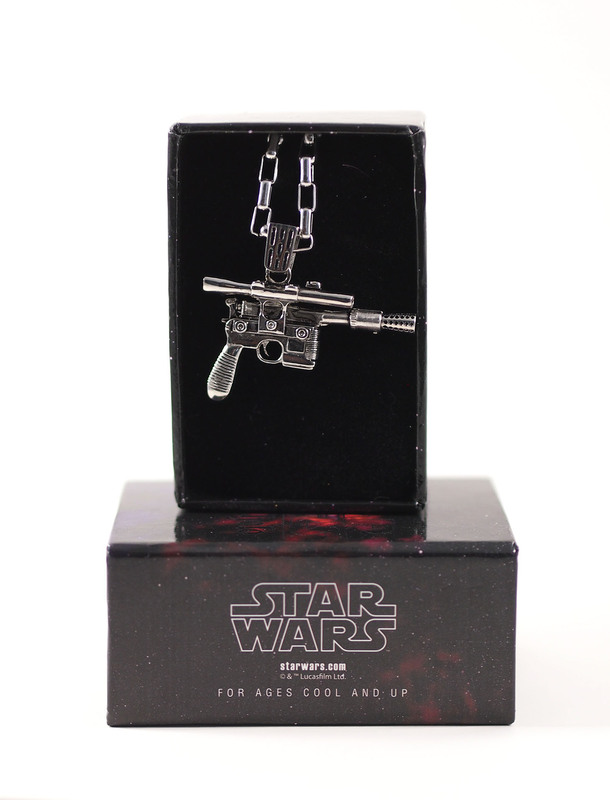 Two lucky winners will receive either a Darth Vader ring or Han Solo Blaster pendant. Enter Now! Those stud earrings look great. 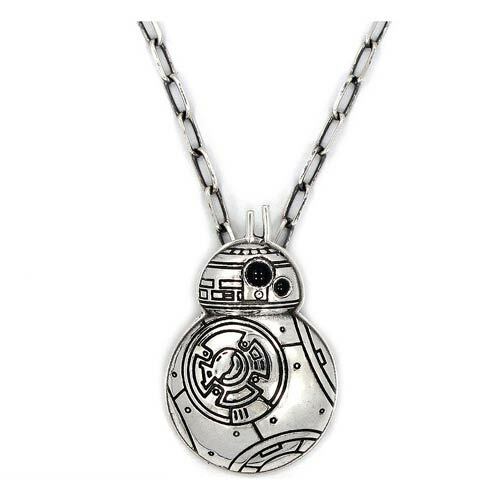 I am obsessed with the BB-8 necklace they released but I wish it wasn’t so expensive! Granted, it’s not silver, but definitely a lot more affordable! Hokey religions and ancient weapons are no match for a good blaster at your side, kid. That pendant is fantastic. All of this is beyond excellent!!!! Super excited! The Han Cholo jewelry looks amazing! I love that blaster necklace! I’d rock the Vader ring EVERYWHERE!! All of this jewelry is amazing! 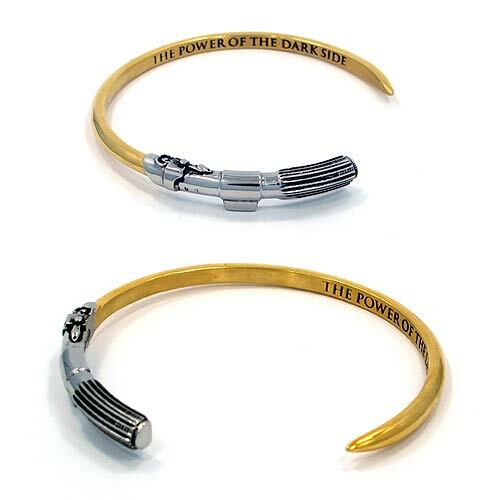 I’ve been on the lookout for some great Star Wars jewelry! This is fantastic! I absolutely love how many pieces are becoming available for female fans! I love the new jewelry! I am so happy to live in a time of Nerd Couture! OMG obsessed. I need it all! OMG obsessed! I need it all! That BB-8 charm is super cute! Yay for everyday need/geek wear! Definitely loving that star wars jewelry is a thing. :] I’m all for the laster necklace and the vader cuff! I can’t get enough of the Vader Cuff and Obi-Wan ring! And the Blaster pendant. Gah! Too many cute things!